It is common knowledge that dolphins die slowly in Taiji. In an attempt to hide their dirty deeds the hunters drive a bamboo stake into the wounds to lessen the spill of dolphin blood into the cove extending the dolphin suffering upwards of 10 minutes. On November 13th the trainers arrived via skiff to carefully select two Risso’s dolphins for captivity. As the slaughter ensued the Dolphin Resort trainers took the traumatized dolphins away in slings to awaiting sea pens. Once trained the two dolphins can bring in upwards of $150,000.00 dollars each from aquariums, and marine parks worldwide. The meat is worth far less. 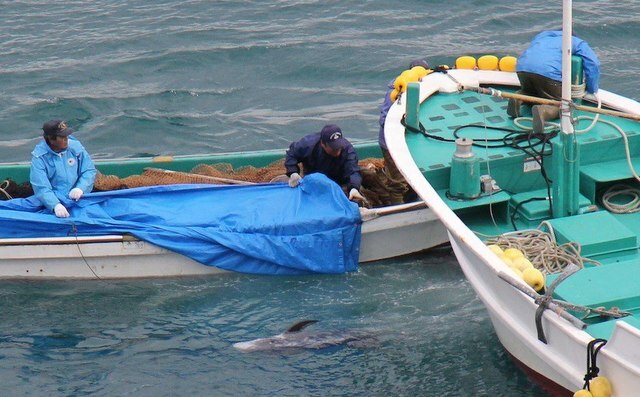 Only minutes after the skiff with the two captive dolphins left the cove the bodies of slaughtered pod were transferred between boat and skiff. The hunters failed to cover their handy work under yet another tarp of shame. Once at the butcher house these poor souls are carved up for local buyers who sell the toxic Mercury laced meat to buyers locally and online. You can see whale bacon for sale on Yahoo.jp. The cruel drive hunt as we know it today began in 1969 and is a combination of a whaling history, pest control, and the hungry captive industry that pays well for their dolphin performers. What can you do? Our Save Japan Dolphin Cove Monitors and Sea Shepherds Conservation Societies Cove Guardians say don’t buy a ticket! Each and every time someone goes to a marine park, swim with dolphins, or attends dolphin assisted therapy they are supporting the slaughter of dolphins in Taiji. Be a voice for the dolphins! You can learn more at Save Japan Dolphins and The Ric O’Barry Dolphin Project. Follow the Cove Guardians live stream direct from the cove during the dolphin drives. Join us everyday at Champions for Cetaceans on Facebook and on our Sister page Save the Blood Dolphins everyday for drive updates and current dolphins issues. As always the 2012 Academy Awards began with a bang. Stars walked the red carpet with the glitz and glamour the world has come to know. As the stars stepped one by one before the snapping cameras describing their outfits another procession, a single file procession was happening on the other side of the world. A pod of 98 beautiful pantropical spotted dolphins was driven into the cove in Taiji, Japan, made famous by winning an academy award only a few years prior in 2009. Horrified volunteers watched as families, mothers, babies, children were driven under the blue tarps by the brutal hunters where they were slowly slaughtered. One dolphin caught on video was partially paralyzed spinning out of control, suffering a slow death last 10 minutes. Money talks in Taiji and there seems to be no lack of orders for captive dolphins. A dead dolphin is hardly worth a 1000 dollars for their meat today. Many of these beautiful sentient beings end up packaged on the sale shelf or in dog food. The meat is known to be toxic with Mercury, PCB’s and other toxins http://bluevoice.org/news_dolphinmeat.php So what drives the hunt? A captive dolphin can be worth as much as 200,000 dollars trained. These dolphins are then shipped around the world by companies like Hong Kong Airlines that use dolphin coffins http://www.abc.net.au/news/2012-02-27/airline-moving-dolphins-in-flying-coffins/3853928/?site=newcastle to carry these traumatized victims to their ultimate destinations, SeaWorlds, Swim with dolphins, marine parks, and dolphin assisted therapy. All for the sake of human entertainment and pleasure. Many stars, some on stage last night, like Ben Stiller have stood up for the dolphins in Taiji. Public Service Announcements featuring some of our most famous hero’s of the film industry have spoken out against this cruel hunt. Ultimately the message is the same. Please don’t buy a ticket to see or interact with dolphins in captivity. The captive dolphin industry supports the slaughter of dolphins in Taiji. A handful of greedy men are making the money of so much dolphin misery. Isn’t it time we stopped it. Let us fight for our ocean counterparts that they may too someday swim down the red carpet of the ocean loved by humans, treated as the amazing and beautiful stars they really are in their own world the oceans. Our voices together can end this. Alone we are but one drop of water, together our voices become an ocean that demand change for the monarchs of the sea. Join us as we fight to save the monarchs of the sea each and everyday! “Sexual maturity is reached at 12-15 years. Longevity is about 55–60 years. Gestation lasts approximately 12 months and there is a three or four year gap between having babies”. At first one might think the above description is referring to the life time, and reproductive process of a human. Interestingly, this is not the life span of a human but a striped dolphin. Their brains are large as mans, and they live in a uniquely complex social world where family is everything. These deep water pelagic beings do not often venture close to shorelines but prefer the open sea. Being elusive their actual numbers are considered data deficient. They have been found to be most resistant to imprisonment (captivity), and have proven to be untrainable. These noble beings cannot be broken. Sadly no mercy or respect is shown to the monarchs of the sea in Taiji Japan. The small town coastal town stubbornly continues to hunt dolphins rejecting all modern scientific discoveries revealing advanced intelligence and sensitivity in cetaceans. A senseless slaughter supported by the captive dolphin industry gives this small group of men the incentive to continue the hunt. February 12th, 2012 will be yet another day of memory for another pod lost. Approximately 33 striped dolphins were driven into the cove after a chase lasting several hours. 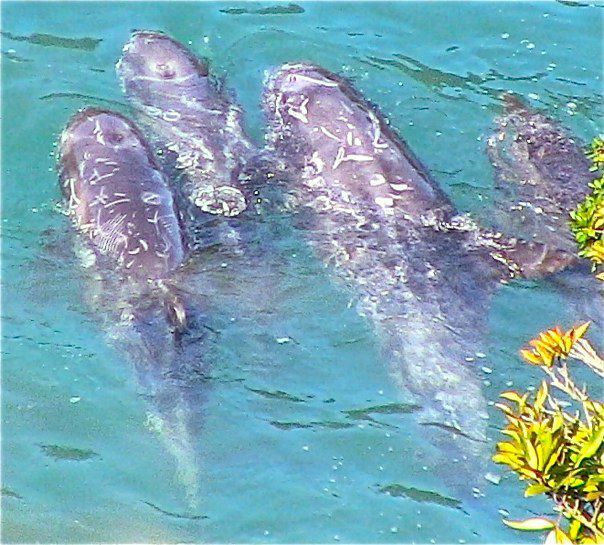 Once the dolphins were exhausted, and panicked the hunters pushed them into the cove, netted them off and then one by one dragged them into the shallows slowly slaughtering the fighting dolphin family. Striped dolphins are known to panic in the cove often launching onto the rocky cliffs. Activists on the ground in Taiji report of the suffering SeaShepherd, “Taiji: Dolphins thrashing and Killers yelling as pod is murdered one by one under the tarps. 11:37am #tweet4taiji”. The Japanese Government has tried to claim that they are slaughtering these highly sensitive beings humanely. Last year’s undercover filming under the blue tarp by Dieter Hagmann demonstrated suffering beyond imagination that continued for 7 minutes. 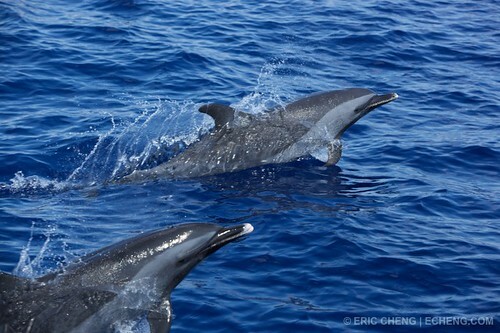 Sea Shepherds, “Taiji: 31 striped dolphins were murdered today. 2 babies w/ mother released at sea. Questionable if mother was still alive”. So why does the killing and capturing continue? 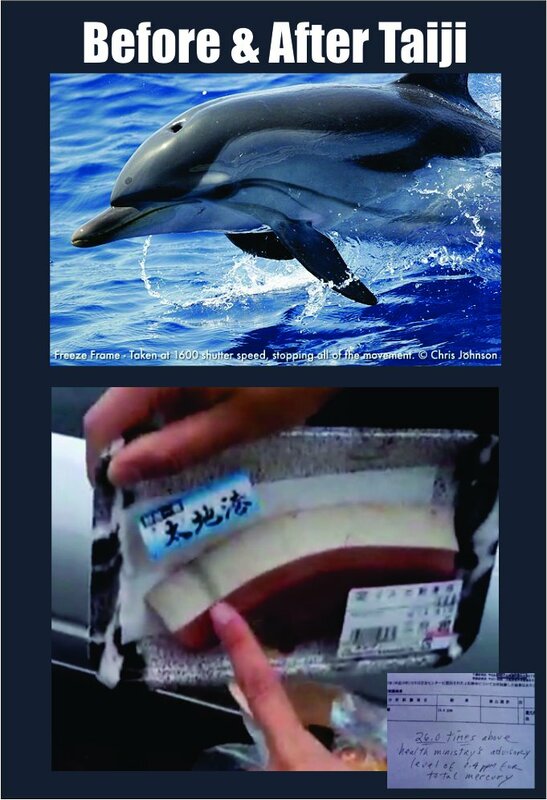 The meat is still sold in the grocery stores although it’s demand is dying quickly as the people of Japan attempt to get foods free of toxins and the popularity of dolphin meat has declined radically. The captive industry continues to subsidize the slaughter but why does the slaughter continue? It seems the dolphin hunters of Taiji know the days of the hunt are over. For the last 40 years 1000’s upon 1000’s of dolphins have been murdered in The Cove. Now it’s time to end it. Let’s start talking and working on a solution. As the Christmas holidays are upon us the dolphin hunters of Taiji continue to give the gift of death to dolphin families traveling by Taiji’s dark and dangerous coastline. Almost everyday pod after pod of dolphins have been driven into the bloody cove where they have been mercilessly slaughtered by 26 sadistic killers. On December 20th when 10 banger boats headed out to sea thousands of people began hoping the hunters would come back empty handed. When the 11th, and 12th boat headed out to join the rest it seemed apparent that dolphins had been spotted and the drive would begin. Activists on the ground in Taiji looked to the horizon watching for the banger boats to move into drive formation. 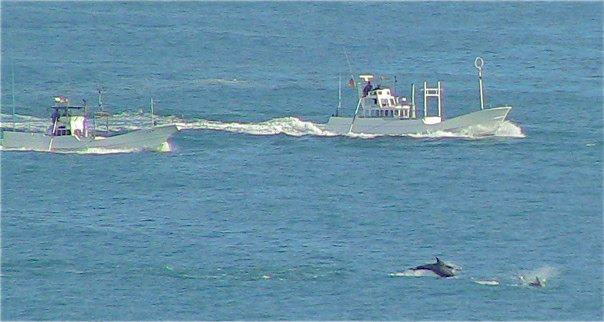 Then the pod was spotted, “SeaShepherd: Taiji: A pod of dolphins being driven north toward Taiji. Still a distance away. Could be a bad day in Taiji”. The news the world had been dreading came about. A pod, a family, of bottlenose dolphins with one juvenile were being driven into the cove. Unlike days before where slaughter began immediately the pod was netted off overnight without food in shallow waters to await their fates at the hands of the hunters, and the trainers of Dolphin Base. Sea Shepherds tweeted, “Taiji: Pod is very agitated. Now jumping and spyhopping”. The nervous pod had a long night ahead. The dolphin hunters have made yet, another Christmas holiday tense and ugly for the town of Taiji. A family of dolphins traveling past Taiji Japan was forever destroyed on December 21st, 2011. The hunters think they can now just rinse the blood of innocent dolphins off their hands, and white shiny boots, and go about celebrating the holidays. As they go on to their warm houses, and ring in Christmas and the New Year the surviving bottlenose dolphins are forced to deal with the loss of their families, adjust to a life of imprisonment, and endure the trauma of watching their family murdered in the bloody cove. 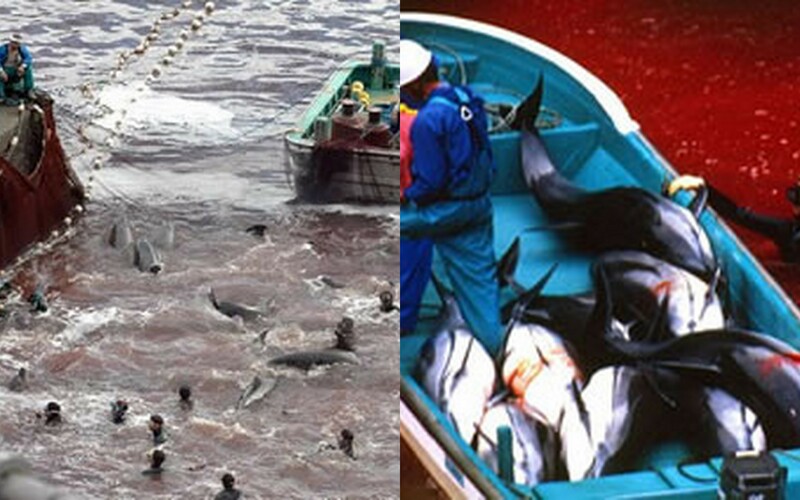 The dolphin hunters want to seen as “Fisherman”. They want the world to see them as fathers and husbands who care and love their community and families. Unfortunately, they will never be seen as anything but dolphin killers, cruel and sadistic. At a time when science knows how amazingly intelligent dolphins are the inhumane treatment these gentle creatures get in Taiji is deplorable and unacceptable. The dolphin hunters of Taiji have created their own modern history which has been caught on film in photos for years now. These are the images people will remember about Taiji, panicked dolphins being kicked off the rocks, drowned, speared, and slaughtered, suffering for up to 7 minutes while the cruel killers sever their spines and slowly carve them up while still alive as seen the famous Dieter Hagmann video: http://vimeo.com/28720693. Dolphin hunting is indeed a dying business. The meat is poison, the killing inhumane beyond imagination, and the captivity that pays for it all can hardly be called traditional. 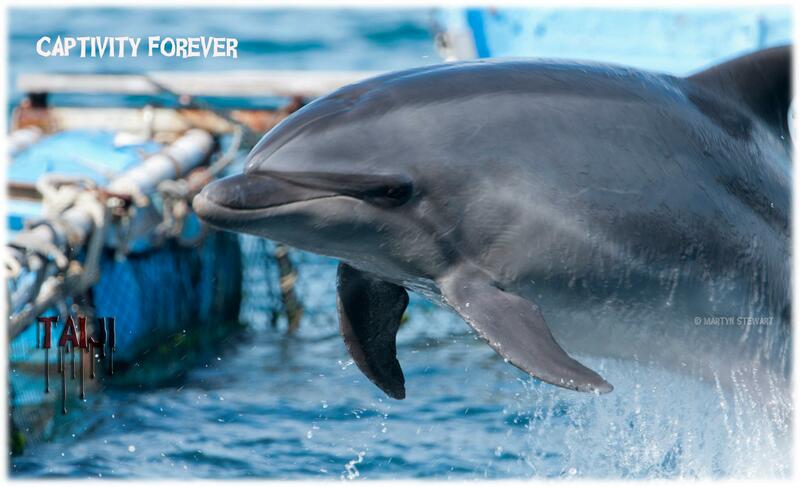 The gift of captivity and death to this pod of bottlenose dolphins will not be forgotten. 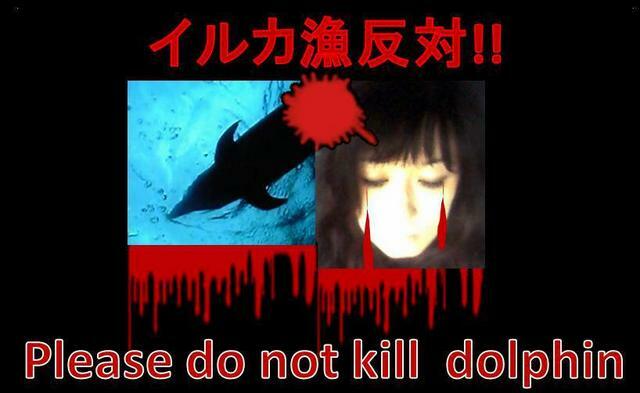 The dolphin killers can pretend to lead normal lives. They can try to show a rationale face to the world of men who can care and love, but the world has seen who they really are. They have twisted Taiji’s history and brought shame upon Japan this holiday and everyday they continue their inhumane and cruel hunt of the people of the sea. 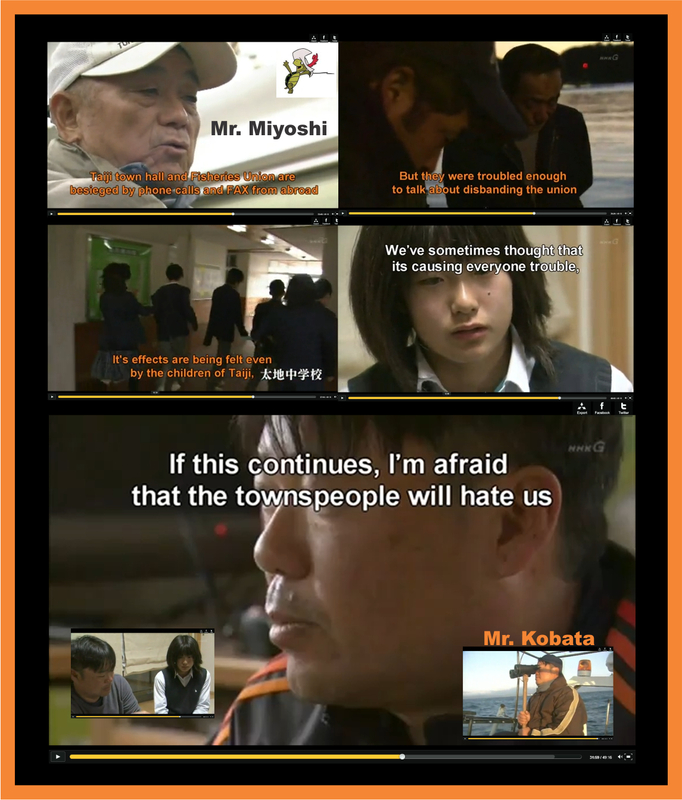 The dolphin killers know they are hated by the world and with good reason. They know they are called monsters of death, and with good reason. Sadly, that is how they will be remembered. 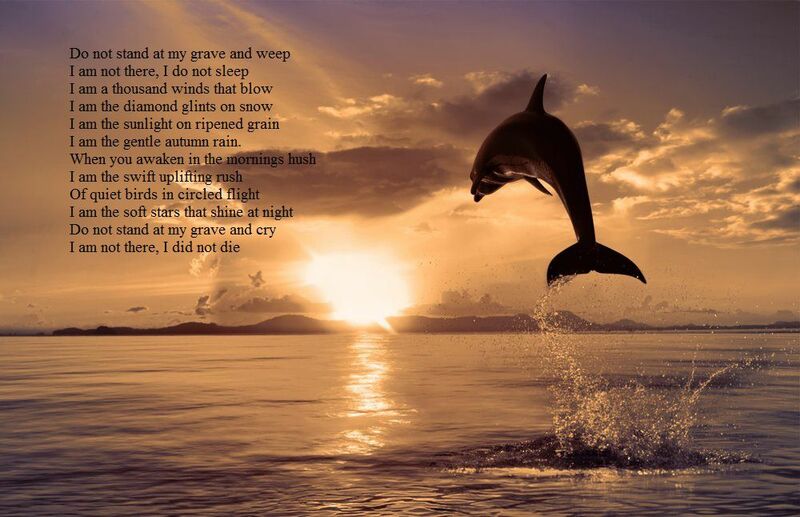 RIP to the ten Risso dolphins murdered, and sadness for what lies ahead for the shattered pod. They must have been numb and grief filled beyond human understanding. “The highly elaborated cingulate and insular cortex in cetacean brains are consistent with the idea that these animals are highly sophisticated and sensitive in the emotional and social -emotional sophistication not achieved by other animals including humans “(Phillip Brakes and Mark Peter Simmonds, Whales and Dolphins Cognition, Culture, Conservation and Human Perceptions, Washington, DC, Earthscan, 2011). Please join us as we fight to end this terrible loss of dolphin life. The dolphins have gifts they want to share with mankind. Isn’t it time we recognize cetaceans for the higher being they are. Boycott all aquariums, dolphinariums, swim with dolphins and dolphin therapy. The dolphins belong in the ocean not small cement tanks. Dolphins in captivity live only a tiny fraction of their lives compared to a dolphin living free in the ocean. Visit any of these links and please join the cause saving dolphins, whales, and our oceans. Today marks the third dolphin slaughter this week in “The Cove” made famous in the Academy award winning film. Taiji dolphin hunters continue to drive dolphins into the cove despite opposition. The government of Japan issues permits allowing thousands of dolphins to be slaughtered every year. In just one week the dolphin hunters have gone out weather permitting, only to drive pods of risso dolphins back to the cove where they have met brutal deaths at the hands of the hunters. 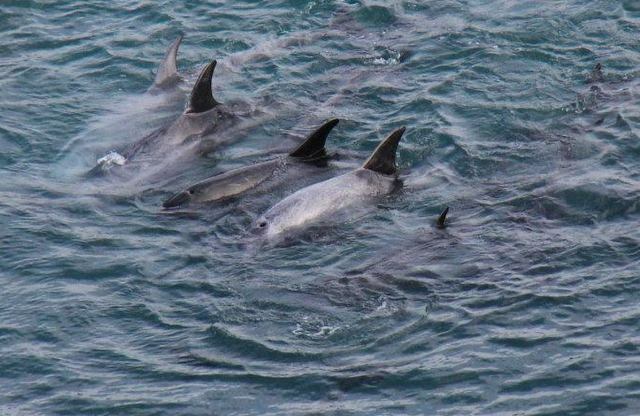 The series of killings began with a pod that had mother and newborn baby in tow, went onto another pod of 10-12 and ended with a pod of 10 dying today another baby and mother led to their bloody deaths. 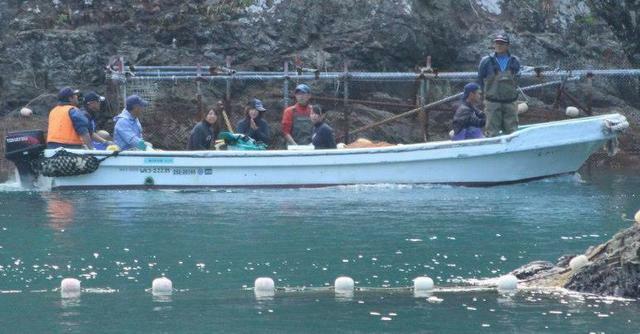 “These families fought hard for their lives” was reported from Taiji. Their fight for life would not be enough to battle the sharp hooks, knives, and bamboo nails used by the hunters. The video below reveals just how horrific their methods of slaughter are causing suffering beyond imagination to these gentle sentient beings. 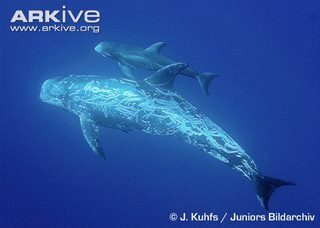 The Risso dolphins (Grampus Griseus) are similar to the pilot whales as they have the large melon heads, with a crease in the forehead. Risso dolphins are dark gray with criss-crossed all over their body from rough play but also from their encounters with their food of choice deep water squid. They are extremely gregarious, living in pods of 10-30. They are known to be gentle, curious, and a delight to all that encounter them. They are family oriented staying together for a life time. Their Social skill are thought to be beyond mans. As the slaughter continues day after day dolphin activists continue to fight for what is right and true, saving the dolphins migrating by Taiji, Japan! I believe together we can make a difference these dolphins! Please join us as we fight to save the people of the sea! They need our help now more than ever!